Not all scorpions are created equal, with some more delicate than others. Different species also have variable natures, some liable to attack anything that could possibly be a meal or a threat and others having a much more laid-back approach. So the first thing you must do is identify the species of scorpion you wish to raise and research its specific care requirements. If you’re new to scorpion care, opt for a peaceful, tolerant species such as the emperor scorpion (Pandinus imperator) and leave the more demanding ones until you have some experience. Unlike many invertebrates, scorpions don’t lay eggs and then wander off. Instead, the females give birth to minute, almost fully formed baby scorpions. They take residence on their mother's back until the first molt, after which they descend and begin living independent lives. As they grow, they molt periodically until they reach their full size, which can take several years. Most individuals live for about five to seven years, but some might survive to the grand old age of 15 or more, making them potentially a long-term commitment. Both juveniles and adults are carnivores, with the only difference in diet being the size of their prey. Provide a steady supply of live insects, tiny ones for a baby scorpion, moving on to larger items as she grows. Go for ones that are half the size of the scorpion or smaller. Suitable small foods include wingless fruit flies and pinhead crickets, while larger ones include crickets, roaches, mealworms, grasshoppers and almost any bug that is the right size and non-toxic. Juveniles need food every couple of days, while adults should be happy with a meal once or twice a week. 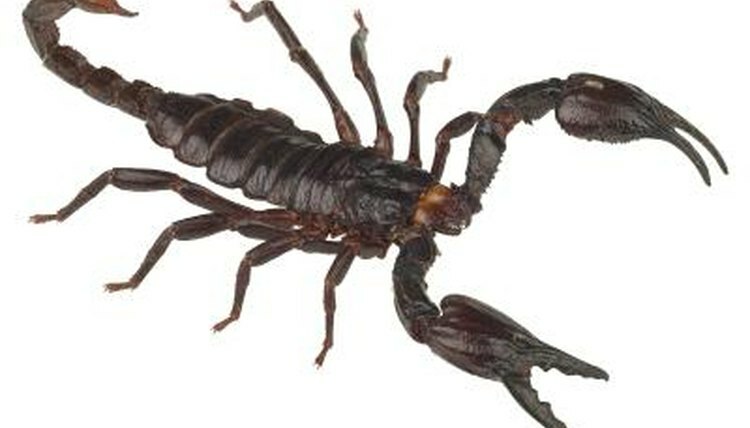 Never provide live foods while the scorpion is molting and vulnerable to injury. Keep baby scorpions in fairly small containers, providing the environmental conditions are right. These containers should provide adequate temperature, ventilation and humidity, all of which vary according to species. Mature scorpions, however, need a larger tank, and you might find this an easier option even for a juvenile. You’ll also need a suitable substrate; chemical-free potting compost for forest scorpions, such as the widely available Emperor scorpion, or sand for desert species, and a shallow water dish. Some scorpions need extra warmth with a heat mat below one end of the tank. Flat rocks, pieces of bark and hollow logs provide hiding places. In contrast to solitary creatures such as tarantulas, scorpions tend to be relatively sociable, or at least not territorial, so you could keep a small group in the same tank. If you wish to go this route, check that it is appropriate for the species and provide plenty of hiding places so they can get away from each other. Males and females kept together might breed, and if this happens, you’ll need to house or find homes for the babies, and there could be many -- some species have broods of nearly 100 babies at a time. Some scorpion species are highly venomous, able to give painful or even dangerous stings, while all have the capacity to alarm people. They are also good at escaping. For these reasons, ensure your scorpion’s housing has a secure lid, with a lock if children are present. If she does escape, tell your neighbors immediately, reassuring them if necessary and telling them what to do if they see her -- normally phone you, and perhaps put a plastic pot over the scorpion to restrain her. Are Scorpion Females or Males More Aggressive? What Happens If a Malaysian Black Forest Scorpion Stings You? How Often Should You Feed a Scorpion?